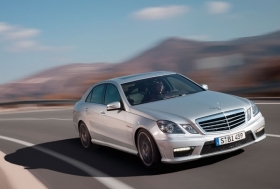 May deliveries of the E-class sedan rose 39 percent to 17,700 units. MUNICH – The race for the No. 2 spot among global luxury carmakers tightened last month after Mercedes-Benz brand beat Audi in global monthly sales for the first time this year thanks to record growth in China. Mercedes' surge in May almost pushed it past BMW brand, which finished the month just 375 units ahead of its rival from Stuttgart. Strong demand for the E- and S-class models last month also allowed Mercedes to close the gap on Audi. The Volkswagen AG premium brand passed Mercedes in January and has forced its rival to remain in the No. 3 spot every month since. Audi and Mercedes reported double-digit sales percentage gains in May thanks to big volume increases in the world's largest auto market. Mercedes-Benz had a record 11,500 sales in China last month, a 121 percent increase from the 5,200 cars it sold in the same month last year. Audi's China sales rose 39.9 percent in May to 17,396 units. Through May, Audi has sold 88,451 cars in China, a new company record for the country's top-selling premium brand. Audi also expects to finish the year with a double-digit increase in sales in the United States, where volume was up 31.4 percent to 39,839 cars after five months. "We didn't expect the trend in sales figures to be so strong" in the United States, Peter Schwarzenbauer, Audi's board member for sales and marketing, said in a statement. Joachim Schmidt, head of sales and marketing at Mercedes-Benz Cars, which includes the Smart and Maybach brands, says May's results are a sign of good things to come for the automaker. "This excellent sales result keeps us on course for a strong second quarter, in which we will post double-digit growth," he said in a statement. The cars leading Mercedes's growth last month were the E class and S class. May deliveries of the E-class sedan rose 39 percent to 17,700 units while demand for the S class increased 41 percent to 5,700 compared with the same month last year. BMW also saw high demand for its flagship 7-series sedan, which competes against the S class. Global monthly sales of the 7 series were up 33.6 percent to 4,501 units compared with May 2009. BMW also got a boost last month from the new BMW 5-series sedan, with an increase of 13.1 percent to 13,716 units.